Met Éireann has issued two Status Orange weather alerts ahead of Storm Diana which is expected to sweep over parts of the south and west of Ireland. Gusts of up to 130km/h are forecast along with high seas and some coastal flooding as the storm tracks over Munster and parts of Connacht tomorrow. An orange wind warning for Cork, Kerry and Waterford comes into effect from 6am to 12pm, while a similar warning will be in place for Wexford, Galway and Clare from 9am until 2pm. 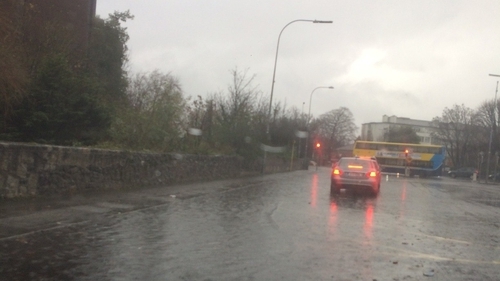 Cork County Council said that its weather assessment team met today to plan for possible coastal flooding, as a result of heavy rainfall, tidal surge and expected high winds. A Status Yellow wind warning has been issued for the rest of the country, valid from 5am to 6pm tomorrow. The Met Office in London has issued a similar alert for much of Northern Ireland. A spokesperson for the National Emergency Coordination Group has said the National Directorate for Fire and Emergency Management (NDFEM) has contacted all local authorities, requesting that they activate their severe weather teams and continue to monitor the weather forecast and Office of Public Works (OPW) high tide advisory updates. The NDFEM has advised local authorities to activate their coordination and crisis management arrangements where necessary. It has also contacted the Department of Transport requesting that it inform the transport sector and Irish Coast Guard. The NDFEM has said it will continue to monitor the situation with Met Éireann and the OPW. The forecast of severe weather follows strong winds and heavy rains today, which led to restrictions being put in place at Dublin Port where terminal operations were shut down for much of the morning. Communications Manager at Dublin Port Charlie Murphy said that while ships could dock in the port, they could not load or unload due to safety concerns. Operations resumed at midday.